This week, I had the pleasure of talking with the owner of BB’s Cafe in Houston, TX. They are a New Orleans and Texas-inspired restaurant with their own take on food, which they have dubbed Tex-Orleans. Houstonians have a serious love for BB’s Crawfish, Gumbo and Po’Boys as can be seen all over social media. We chatted about BB’s Maw Maw, his family history in New Orleans, how BB’s has grown and how to make Grillades and Grits! YUM!! Add in 5 TBL cajun seasoning, 2 cups Worcestershire and 2 cups olive oil. Marinate for 24 hours. Make your favorite Grits recipe. When roux is a nice chocolate brown color, add 2 cups bell pepper, 2 cups onion and 1/2 cup garlic. Sauté until wilted. Add in 16oz Rotel tomatoes and 5 TBL of Cajun Seasoning, 16 oz beef broth and 2 cups water. Bring to rolling boil and cook for 15 minutes. Reduce to low/medium heat and cook for 4 hours. Remove/skim grease. 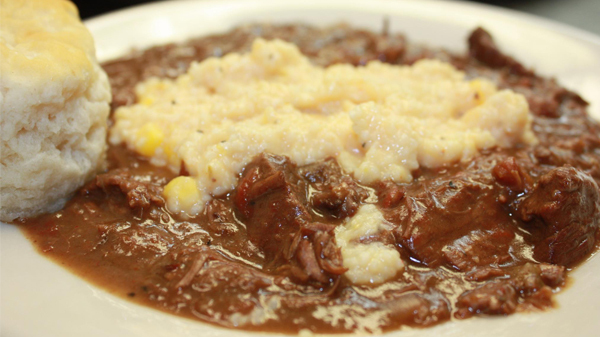 Serve in large bowl with grits on top. We Recommend serving it with a buttermilk biscuit. Connect with BB’s online, on Facebook, Twitter or Instagram.